It is almost a time honored tradition that every girl strives to live up to – to make their man grovel and beg for their forgiveness for a mistake they made. And they only relent when there is a worthy cause – like a really nice bauble to make them change their mind. But honestly, even if the men grumble till kingdom come about them having to do all this for their women and crib about how they are reduced to beggars for one smile or at least reconciliation, they love every bit of it. It makes them feel like they are in a real love-relationship. And if you think that this has started escalating only in recent times, I beg to differ. There are many who feel that Valentines Day and films are responsible for this filmi business filtering into our society. Well, for all those people I just have to say that this used to happen a *looooonngg*time back too. 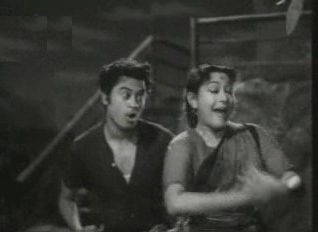 For instance, there is a song from the movie Jaalsaaz, yes – the black and white film featuring none other than Kishore Kumar and Mala Sinha, which goes like “Arra ra ra todo na dil bekaraar ka…” that shows a very persistent and troubled Kishore running after a huffy Mala Sinha. He is actually persuading her to accept his loving gift and stop sulking. She, in turn, is acting pricy like a lady. The song is so cute, it really makes you chuckle and giggle as you take a trip down memory lane. 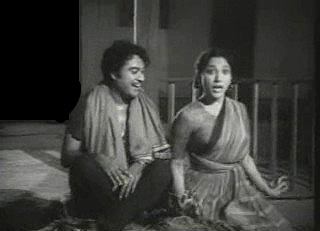 Throughout this rib tickling number, we see Kishore running behind Mala Sinha in a beautifully done up village set. It is just nature, the moonlight and the two lovers. There is nothing crass about the way he is trying to persuade her – that is the beauty of the song. It is filled with innocent love. The humor is really great as you can see he is enjoying trying to get her to stop being angry as just when she is about to relent, he pours a mug full of cold water down her head, then hands her a stick and runs off. 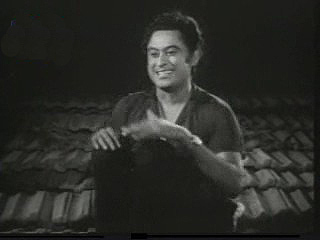 The music, given by Narayan Dutta is perfect, especially, the use of the accordion. Also, the way he gets the Goan element into the song is simply superb. The lyrics written by Majrooh Sultanpuri suit the duo on screen beautifully and are simple, yet fun filled, which is the point in the first place. But the cake goes to Kishore Kumar for not only doing a great job on screen, but also wonderful vocals, along with Asha Bhonsle. The vocals suit both characters and have a youthful vitality which is very essential for the mood of the song. I definitely recommend you to catch this song as you will have it in your head the whole day; which means a superb day lies ahead of you. This entry was posted on Monday, July 16th, 2007 at 8:46 pm	and is filed under Suhane Geet. You can follow any responses to this entry through the RSS 2.0 feed. You can skip to the end and leave a response. Pinging is currently not allowed. good write up..i liked the flow and the embedded pics in between. BTW, who is writing this? can you pl reveal your identity to receive a round of applause plz? I have the video of this song,it is a masterpiece and very enjoyable. Great, after a long time I am back and the what I see is awesome. about you, so don’t hide.